For medical gas installation in North Carolina or medical gas pipeline installers, Lewis Systems has the knowledge and the experience to get the job done quickly and to the proper specifications. Specially trained technicians are required to install medical gas systems and pipeline equipment for optimum safety and security to your staff and patients. We provide professional medical gas pipeline installers and equipment technicians at all of our Lewis Systems locations. 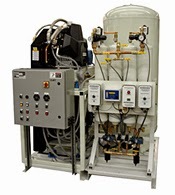 Let Lewis Systems configure, install, test, maintain, and provide your Powerex and Tri-tech medical gas systems and pipeline equipment, assuring that you get the most economic configuration within a minimum amount of floor space that offers you superior efficiency. Further, we’ll test your medical air system and service it on a schedule that’s convenient for you. Contact Lewis Systems for medical gas installation in North Carolina, whether your business is a surgical center, healthcare facility, or medical treatment center in need of medical gas systems and installation.